The Ride Plus is a well built bike starting with a strong sturdy frame that also creates good riding stability. The carrier has a high capacity so you can take everything that you need. The large battery capcity means you can eat up lots of miles. For more detailed information, please download the Ride Plus manual. How fast and how far can the Ride Plus go? 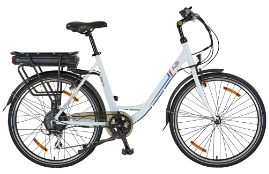 The Ride Plus can reach speed of up to 18.7mph (30.2 km/h) worldwide and in Europe 15.5 mph (25 km/h), however you can pedal faster. The Ride Plus will assist you up to 40 miles (64km) (the distance varies depending on the weight of the rider and riding conditions). How does the Ride Plus handle hills? With the power from the rear hub motor combined with the correct selection of gear, you will find that the Ride Plus will take on the hills without hassle. Can I buy accessories for the Ride Plus? The Ride Plus has 5 levels of assistance to allow you to control the power. A full range of gears also allow you to set your cadence to the conditions or your preference. How do I charge the Ride Plus? To recharge the battery simply plug the charger into any standard outlet and connect it to your portable battery (either on the bike or off the bike inside). To complete a full charge may take up to five hours depending on how discharged the battery is at the beginning of the charging process. For the best performance we recommend to charge your Ride Plus battery at least every two months and if you are using it frequently try to use as much of the capacity before charging. The battery should be charged in temperatures greater than 10 degrees and not above 35 degrees.